Do you love scuba diving but haven't had the chance to dive for a while? Take a Refresher Course and resume having fun. 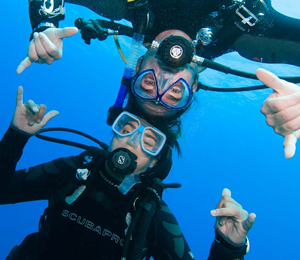 You can brush up on basic diving information or step up your skills to new levels. Learning to become a dive master or rescue diver is a challenge, but both are useful in several ways. Teaching others to dive and rescuing divers in trouble are just two advantages of having these certifications. You may feel that you're ready for the Advanced Open Water Course when you need a Refresher Course. Those who are learning how to dive take the Open Water Course and can go right to the advanced course when they complete it, so if you're experienced, this may be helpful. The advanced course includes underwater navigation and diving in deeper water plus one of 15 adventure dives. Adventure diving is quite a thrill for divers who like deep diving and wreck diving. Key West diving is particularly exciting at the USNS Vandenberg, a sunken ship that is now the largest man-made reef in the National Marine Sanctuary of the Florida Keys. Along with having a great deal of fun, divers can develop underwater careers of photography, natural sciences, navigation and videography. A refresher course could lead to more than safer recreational diving; it could lead to a salary. If you're taking a Refresher Course, you also might want to take the Project AWARE Fish Identification Course so that you know what you're seeing underwater. Knowing what kind of fish you're seeing makes it more interesting because warm-water fish species vary in different parts of the world. Learn digital underwater photography and capture images of fish to examine later. It's quite a science lesson for the kids, too. Did someone say "kids?" The Bubble-maker Experience for kids eight years and up gets them ready to scuba dive for a family adventure that will make wonderful memories. Scuba diving may even spark an interest in marine biology in the future. 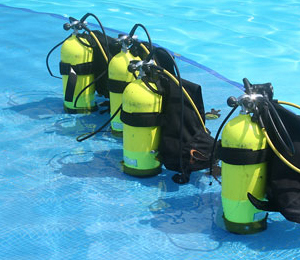 When you take the Refresher Course, the kids can be scheduled for this diving class. A good thing to know when diving is how to be an Emergency Oxygen Provider, another course taught. 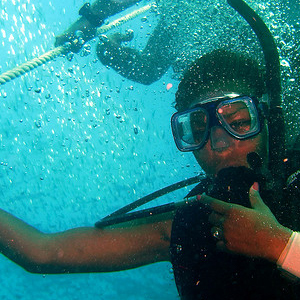 You'll learn how to give oxygen to someone in trouble underwater as well as how to recognize diving-related illnesses. It may be invaluable. In a similar vein, the Dan Oxygen Provider course teaches divers how to give oxygen to an injured diver. Various systems for oxygen delivery are reviewed as well as types of injuries that may occur underwater. The Enriched Air Nitrox Course provides ways to give divers more time underwater. This technique also allows for water reentry sooner during repetitive diving. More diving in a shorter amount of time may be helpful to divers with very busy schedules. If you want to get a jump-start on learning more about diving, e-learning is an excellent resource. Ask us about the best course for you.